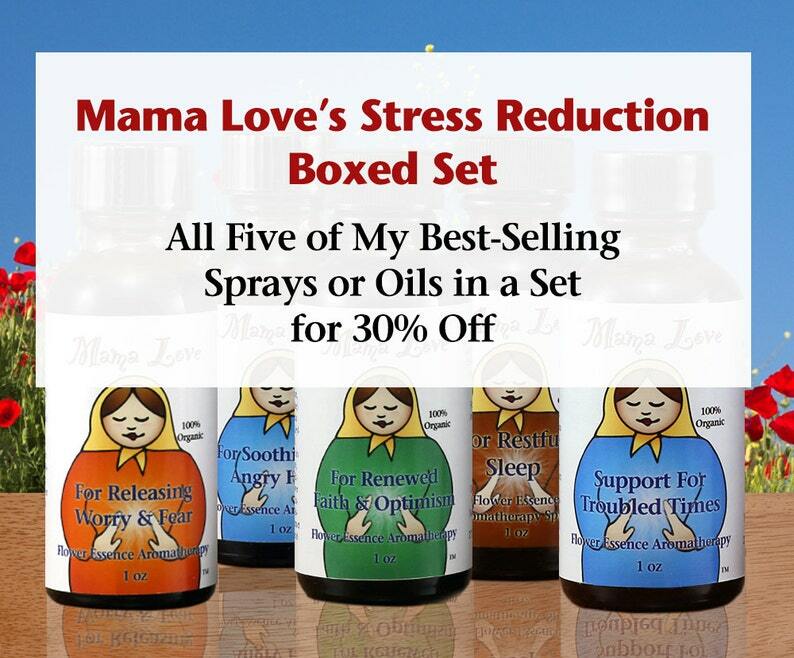 My best-selling Mama Love flower essence aromatherapy oils and sprays are all about stress reduction. "Releasing Worry and Fear," "Soothing the Angry Heart," "Restful Sleep," "Renewed Faith and Optimism," and "Support for Troubled Times" are so well-loved people buy them again and again. This is an opportunity to get all five at a 30% discount in a single boxed set. Makes a wonderful gift. Choose between 1 oz sprays or 1 oz oils in a ready to wrap box. My Mama Love oils are wonderful in the bath, as an after bath body oil, or for massage. Some people even use them as a very light perfume! The flower essences and essential oils sink into your skin to do their work while the 100% organic jojoba oil moisturizes and makes your skin feel soft and beautiful. The sprays are fantastic for both an aura and body mist and to shift the feeling of an environment. And the healing power of Reiki (natural healing energy) in all my products makes them all the more effective. These spiritually-guided products are handmade, all natural and made of at least 98% organic or ethically wildcrafted botanical ingredients.